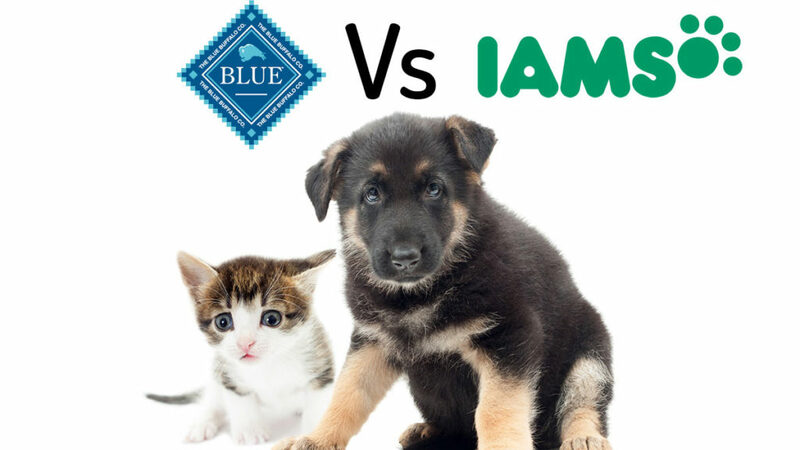 Blue Buffalo vs Iams 2019 : which one is the most Nutritionally Fur-tified? What is the one thing that all house pets have in common? You may have guessed right, they all require an adequate amount of nourishment for their daily hop-step-jumps. There is no better way to show your cat or dog some tender love and care than to provide then with the most nourishing wet or dry meals packed with nutrients for their health and development at all stages in their lives from kittens and pups to adult cats and dogs. Before the end of this article we will answer all your throbbing pet food questions and you will learn how to pick the best food brand for your pet. stick with us and lets get started! Introducing to you, the Blue buffalo pet food brand and the indomitable Iams; this comparison, between two great pet food brands is to determine which one is a better choice using various parameters such as nutritional value, ingredients quality, price, safety, brand history, and general awesomeness. After you are done with this awesome comparison, check out Blue Buffalo and Iams here to see the different flavors and pricing. Blue Buffalo leads in dry dog and dry cat food protein with a difference of 1.1% and 0.8% respectively while Iams turns the table with a 1.6% and 5.1% lead in wet dog food and wet cat food respectively. Blue Buffalo is more expensive than Iams of all food types per pound as well as per calorie whereas Iams boasts of one of the cheapest pet food prices in the market. Iams has an aggregate of 85 dog and cat flavors as well as treats whereas Blue Buffalo dominates with a whopping 339 aggregate of dog and cat food. Iams has had 2 recalls only while Blue Buffalo has had 9 recalls in history. Every pet food contains a certain amount of ingredients and varying nutritional value which can be measured in terms of calorie value, weight in pound, dry matter content, and various other metrics. The rationale behind the nutrient concentration report emphasized by the regulatory body AAFCO is to state the precise nutritional content and proportion of all ingredients in cat and dog food. This would provide a better understanding of what to expect from every brand and to enable comparisons. An informed choice can be made when shopping for a pet food product when the food ingredients are clearly represented on the package in figures. Many pets have specific nutritional needs and these should be met by the pet owner’s brand of choice. The anatomy of pets and metabolism greatly differ from specie to the other as well as one stage of life to the other. There are recommended concentrations of various food groups which help in the maintenance of your pet’s body weight, development, immunity, and physical well being. When it comes to nutritional value, there are a ton of ingredients to look out for such as protein, fat, fiber, carbohydrates, moisture, vitamins and minerals. All these come in various concentrations following the minimum and maximum recommendation of the AAFCO regulatory body. For this comparison, let’s take a look at the quantity of the principal ingredients for both cat and dog food brands. The guaranteed analysis for every pet food product is an accurate representation of nutritional content of every meal or treat, specifically Crude protein, crude fiber, and crude fat. All percentage values represented on the table is based on dry matter. There are many reasons why protein is a principal ingredient in pet food, especially for cats and dogs. These furry friends require a high protein diet for growth and development. A reduction in daily protein or insufficiency can lead to weight loss and a good number of health problems and deficiency symptoms. The Iams pet food brand provides at least 5.16% more protein than the Blue buffalo. Fiber Fiber content is also essential in every meal for its contributions to digestion. Many pets often present with digestive system issues due to their sensitivity to certain types of meals or ingredients. Hence, meals with adequate amount of fiber enable proper digestion. Which of the pet food brand is more expensive? How can we effectively compare costs? The table below shows the cost comparison for Blue Buffalo and Iams using two of the most accurate metrics for price deduction. From the table we can deduce that Blue Buffalo is a more expensive brand on all food types. Both metrics, per pound (lb) and per calorie (kcal) are the most accurate for checking the average cost, although the cost per pound is variably influenced by moisture content in the food while the average cost per calorie deals strictly with dry matter. This makes the cost per calorie a more reliable metric for cost comparison. There are a ton of rich holistic flavors manufactured by the Blue Buffalo brand categorized as dry and wet foods as well as dog treat. These recipes are mainly inspired by homemade ingenuity, well formulated to support the complete health, vigor and well-being of your dog. Blue Buffalo is widely known for its wide variety and diversity of flavor and ingredients, these food flavors include turkey and potato, meat loaf meals, meat chunk in rich gravy, braised beef with veges and rice, chicken pie family recipes, grain-free diets, duck stew, and other unique blend of flavors. Each delicious recipe comes with the finest ingredients, fillers, and protection formula to boost the immune system as well as its antioxidant properties. A proactive health and life style is what the Iams brand promises, with an array of pet food flavors to provide vitality for pets of all stages of life. The brand utilizes essentials and an all-natural ingredient to create the most delectable pet dishes that keeps our furry friends coming back for more. These flavors include but not limited to lamb, turkey, gravy, chicken, whole grain rice, beef, ocean fish, vegetables and more. Check out the current Blue Buffalo recipes and Iams recipes here. This brand started as a family business inspired by a pet. When the family dog started to experience health problems it was left to the owners to device a meal recipe to improve the health of their furry friend. The owners of Blue decide that it would be best to handle this in a unique manner, feeding the dog with natural and quality food. Fortunately, there was a huge market for pet food at the time. The brand categorizes pet foods by dog specialities such as Freedom, Wilderness, Life Protection Formula, Basics and Natural Veterinary Diet. The veteran pet food brand, named after the founder Paul Iams, manufactures and distributes high-end cat and dog pet food in various regions in the united states such as Ohio, North Carolina, Lewisburg, and others as well as in 70 countries worldwide. It remains one of the fastest growing pet food companies and a leading brand all over the world. Looking critically at the data set, Iams has more protein content and in cheaper than blue buffalo, but blue buffalo comes in a wide variety of flavors, giving your pet more meal options. It may seem like a tie at this point but Iams takes a last minute lead with only two safety recalls in history while the blue buffalo settles for 2nd place with 9 recalls. Both brands however, are industry leaders in pet food and are popular in over 70 countries.